Researchers at Karolinska Institutet have developed a nanoparticle technology that can be used to stabilise membrane proteins so that their structure can be studied in a lipid environment. The method, described in Nature Methods, makes it possible to access drug targets that previously could not be investigated and therefore potentially allows for the development of novel drugs, therapeutic antibodies and vaccines. Membrane proteins are the targets of more than 60 per cent of drugs in clinical use. In addition, the membrane proteins of viruses are the key functional unit in commercial vaccines. 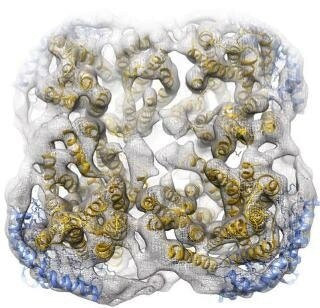 Thus, membrane proteins are very important in biology, drug discovery and vaccination. The problem that researchers face is that these proteins are very unstable and therefore hard to investigate. They are embedded in membranes that are made up of different kinds of lipids. Most often, detergents are used to extract the membrane proteins. However, detergents are associated with protein instability and poor compatibility with structural and biophysical studies. Moreover, detergents do not provide a lipid environment, which is important for membrane proteins. The work was performed in Professor Pär Nordlund's group at Karolinska Institutet, in collaboration with researchers at the Department of Biosciences and Nutrition at Karolinska Institutet, University of California San Fransisco and European Molecular Biology Laboratory, EMBL. The project was financially supported by, among others, the European Molecular Biology Organization (EMBO), the Swedish Research Council, the Knut and Alice Wallenberg foundation, the Swedish Cancer Society and the Swedish Childhood Cancer Foundation. Jens Frauenfeld has founded the company Salipro Biotech AB, and three of the researchers have filed patent applications related to the work.